Notes: I knit this in the round instead of flat, the way the instructions say. This resulted in some unsightly holes along the side, where the cables met up. It was easy enough to reign this in after I finished knitting, by strategically weaving in the ends, but you might want to stick with doing it flat. 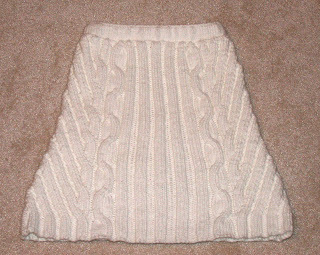 This started out as a tube top for me, but it got converted to a skirt for my daughter. To do this, I followed the directions up to the point of the waist decreases. I did not do any of the waist increases. Instead, I just knit straight till I was about 3 inches shy of the desired length. I then switched to smaller needles (from size 8 down to size 6) and knit straight for another 2 inches, completing a cable twist for the serpentine cables. On the next row, I decreased 2 stitches at the top of each cable to prevent them from stretching out and also to get the right size for the waistband. 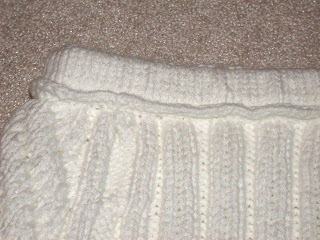 The waistband is just 8 rows of stockinette, 1 row of purl (to make it easier to turn in), and then another 8 rows of stockinette. Since I'm not a big fan of sewing by hand, I folded the waistband over at this point and then knit in the waistband--just as you would knit in a hem--leaving a 1" hole to put in the elastic. I then turned the work over and went back the other way to bind off. After putting in the waistband elastic, I only had a small hole to sew up. I LOVE the top.. Thanks for the pattern.. Your skirt if also terrific..
What size do you think it came out?? How old is your Daughter?? ?